Years ago, when we were expecting our fourth child, it became painfully obvious the baby was coming on Mother’s Day. So Nancy played the piano for the service, I preached and she had contractions all along. When church was out we headed immediately to the hospital in my old 53 Chev ¾ ton rough riding pickup. Soon we were at St. Joseph’s Hospital and our doctor, John Atkinson, was called. John said there was nothing he would rather do than be called out to deliver a baby on Mother’s Day. Family birthday party for Caleb on the lawn. Note little Ezra standing. It seemed as if being a mother was not adequate. You have to have a special degree, a title and a career to be suitable. Really? I wonder what Eve, the “mother of all living” would have thought. Or, what about Mary who gave birth to Christ. I am not against a mother working if home is in order; the Proverbs 31 woman did. But whatever happened to the glory of motherhood? Nancy and I recall high school in the 1960’s. Home Economics was a regular course where girls learned how to run an efficient home and raise a family. Some took it all four years. Getting the Betty Crocker award was a big deal. But the women’s movement of the 70’s along with the sexual revolution changed all that. Motherhood became unpopular while being a “professional” came in. Today, upon graduation from high school girls are asked what their plans are? Being domestic is not a consideration and is a relic of the past. Who even knows who Betty Crocker was? Home Economics is a minor part of the curriculum. By the way, Nancy and I had a great time at her reunion and surprising our son Ezra (the Mother's Day baby) and his wife and our two little grand kids there in LA. 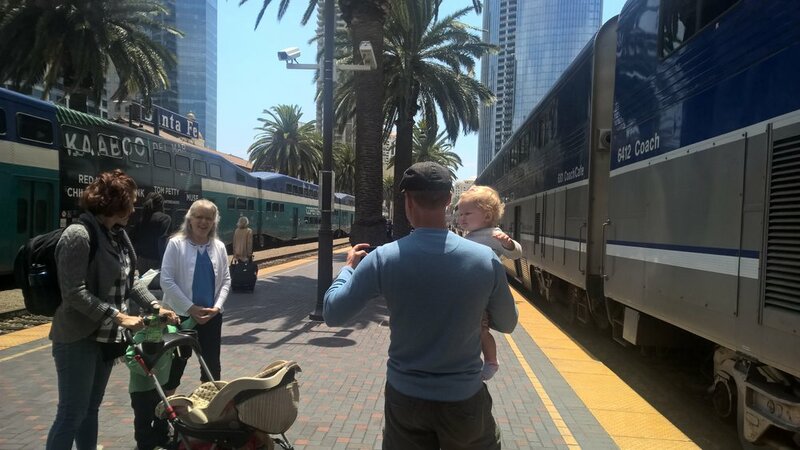 We went on a family train trip to San Diego so see the sights and had a wonderful time. Surprise visit for Ezra's 36th birthday in LA this week as we remembered his birth on Mother's Day. Arriving at San Deigo Union Station. Little Noah, who loves trains, and his dad gets to meet engineer Mike who got us home safe. Grandpa Mark and Noah loving the train ride. This Sunday we are back to celebrate Mother's Day at church with a special coffee and snack time (Bring Mom's favorite) at 9:15 as well as Mother's Day worship service at 10:30 where I'll be speaking on the Glory of Motherhood. Chris, Ruth, Nancy and I all leave on Monday for the 500th Anniversary Reformation Conference in Germany followed by a mission trip to Ukraine. Keep us in prayer.